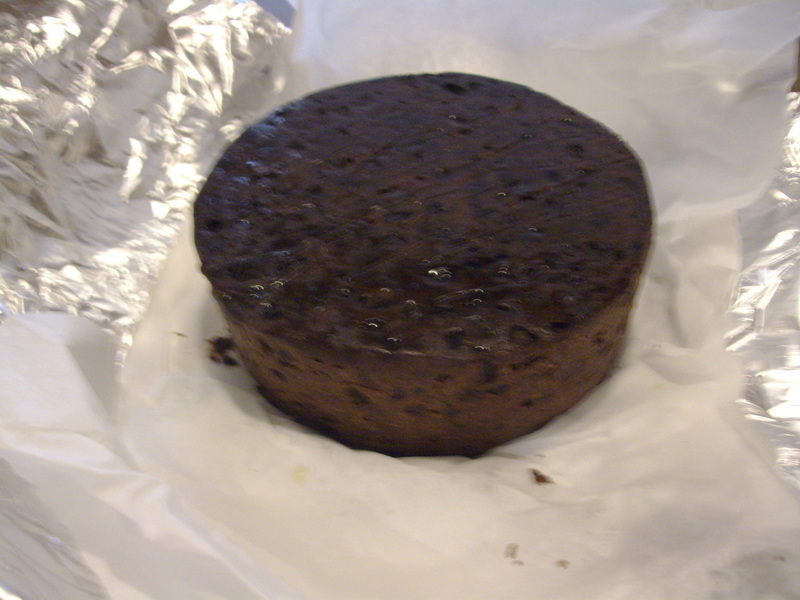 Yesterday we finally got around to making the Christmas cakes. The ingredients had been bought and stored bit by bit – the fruit from England as the variety and price are much better than here in France, the untreated lemons and oranges picked up when they were available and the black treacle was at the back of the cupboard. The recipe we always use is on a piece of paper with a list of ingredients with amounts for different sized cake tins. The ‘method sheet’ has long since disappeared. However, I did remember to soak all the fruit in brandy overnight. It was my task to assemble all the ingredients in the morning and then CC helped me make them after lunch. I had measured out the butter and treacle into two bowls. CC duly creamed the butter and treacle and mixed in the flour (with salt and a generous quantity of spice), eggs (from our chickens) and finally the fruit with lemon and orange zest while I lined three cake tins with three layers of greaseproof paper. She looked and it was in fact the second item! We weighed and added the sugar and then I realised I hadn’t put the nuts in. OK, we only do this once a year but it had come close to disaster. I tried this puzzle. and was relieved to find that I managed to do it so should have nothing to fear for the time being. The cakes are in the oven this morning. Let’s hope I don’t forget them . . . . . . . . . .
Here’s a photo of one of the cakes. The top looks wet because it’s just been ‘watered’ with brandy. We’ll feed the cakes once a week until the middle of December before decorating. As a new little chick she was called Milly but I am pretty sure s/he was developing into a cockerel. He developed a cheeky character quite early on and was not as afraid as his siblings. When they eventually moved from the conservatory into the outside run he was always among the first to come for food and, in fact he would jump on my back and sit on my shoulder like a parrot. He was the one who poohed down my T-shirt when he was ‘helping’ me pick plums and very soon, not content woth climbing up the gate, he would fly over the fence and come up to the door at feeding time. Then, a few days ago he wasn’t there. He didn’t turn up for food in the run either. I thought he may have gone to visit my neighbour but couldn’t see him in her garden. Then yesterday I caught a glimpse of a chicken through the hedge and breathed a sigh of relief. However, when I went round to collect him I found that it was in fact Freya and Fricka who had absconded. Michelle helped me to round them up and return them to our garden; so still no Milly. This evening I suddenly thought of looking among the nettles near the fences between our gardens. Perhaps he was stuck between two fences. But I would have heard him wouldn’t I? No, because all I found was his little body. I’ve no idea what killed him but only his neck was eaten. He will be sadly missed and I’ll make sure everyone else is firmly shut in each evening. Anyway, it was Sunday, a few weeks ago when Kica and I were going for a walk that we bumped into Karine. “Are you going to the library?” she asked. It seemed that the weather was just right for a flight and so Isabel had called everyone to go and watch her have her ride. She hadn’t rung me as she thought I was stuck with my two invalids. However, CC was there to help the carer so I said I was free. Rather than take Kica home, Nadia offered to let her go in the back of her car but there wasn’t room for me as well so I had to go with Sylvie. We drove in convoy to a large field where the machine and it’s owner were waiting. After the usual interval for greeting and kissing everyone we watched as Isabel put on extra clothes ready for her trip in the clouds. She was strapped in and equipped with a helmet which allowed her to communicate with the pilot. One last chsck on wind speed and direction and he started the motor. The parachute lifted immediately and the little machine took off almost vertically, wobbled a bit and then went higher. However, it didn’t travel far before turning and appearing to come into land. Down it came, lower and lower and then, all of a sudden it shot up into the air again. I was hoping Isabel had a strong stomach! This time they were really off and disappeared from view. Everyone took to chatting but as Kica had been deprived of her walk I took her round the field. It was open to the road on one side so I dare no let her off the lead. Eventually we saw them coming back and it took two attempts before they landed – relatively smoothly. We all gathered round to see how Isabel felt and she was exhilarated; not at all anxious, even when it was rough going. Then it was champagne and Gateau Mollet (a very light yeast cake) before we climbed back into the cars and returned to the library. They handed out flyers to advertise the flights and I brought one home but I just hope it doesn’t give my family any ideas for my 70th birthday whi__ch is coming up next month. . . . . . . . . . . .